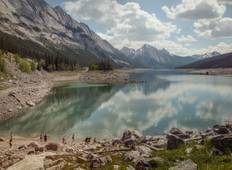 Find a Discovery trip that explores Yoho National Park. There are 29 tours to choose from, that range in length from 7 days up to 25 days. The most popular month for these tours is July, which has the most tour departures. "Our guide Jon was relaxed and accommodated everyone’s needs on the tour with nothing..."
"The tour was amazing. Michelle really went above and beyond for our group, we had..."
"Our tour guide was Jennifer - and she was superb! Her love for the area, the history..."
"Everything exceeded our expectations. Our tour guide Ben was a delight. 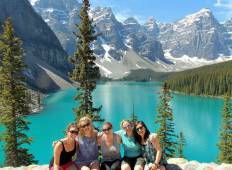 Full of fun..."
"A very enjoyable albeit whirlwind trip seeing the sights of British Columbia and..."
"The only thing that was not organised right was the weather. Otherwise everything..."
"This tour was everything I was hoping it would be. I was able to see Canada the best..."
"Yes everything about the tour was excellent"
"Awesome trip, awesome scenery, awesome people, awesome tour guide!" "Where to start with this amazing adventure....had a blast saw bears, elk etc. Hiked..."
"Despite the unseasonal weather, the scenery was beathtaking and definitely worth..."